Its 11-11 again, and its the time of the year when we can take advantage of online shopping deals just in time before the holidays. 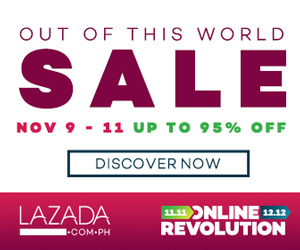 Its an annual thing in Lazada, this 11.11 deals surely is the best time to shop for a new gadget, accessories, or other techie or non-techie stuff from the largest online shopping site in PH. Before we lay out all the best deals we can find, here are some vouchers you can use as discount coupon codes in Lazada for you to get even more savings and value for your money. Okay then, onto the deals. Click here to see all the hourly deals in Lazada. I suggest you check out the hourly deals. It might have a product you’ve always wanted or been needing for a long time. Buying it on sale is always better. First off, I did made an order for a SanDisk 128GB micro SDXC A1 memory card, originally it was at P2488, then with the sales promotion in Lazada, it is now at just P2116. But wait, there’s more, you can still use any of the codes above. I did used the 300 off so I got the 128GB micro SD card for just P1800. From P2500 to P1800, its just too good of a deal to pass on. Will be using this card for my Nintendo Switch. I even linked the 200GB, it was P4488 before, now at P3825, and you can still use a voucher code. You can use these micro SD cards on your smartphones, tablets, even on a sports cam or dash cams. Here are some of my recommended tech products you should check out from Lazada. Buy them while they are discounted, perfect gift for your family or even just for yourself. It was P7000 before, but now at just P3999 for a Windows notebook and tablet in one, this is a good deal already. You’ll have office access anywhere, plus its 8″ display makes it really portable. If you are looking for a new phone to buy, but you have very limited budget, consider this Asus ZenFone 2 Laser. It is now at P4999, previously priced at P8000. It has relatively good overall specs, at its current price it is surely a great deal. If someone will ask me for an advice for a smartphone to buy, and they have P5k max budget, then it will surely be this Asus Zenfone 2 Laser. Another great deal for a smartphone on a budget, this one is from O+, it is currently at P3299. For its overall specs, it is definitely a steal. It beats any other budget smart phones out there with its current price and great specs. This phone was initially introduced at almost P11000 before, grab one while you still can I am pretty sure this will get sold out real soon. Cheap yet tested and proven quality powerbank you can get at just P669. It is perfect as gift or personal use, the 20000mAh capacity gives you more than enough juice to last you for a day without the need of wall chargers for all your devices when you are out of the house. You can get it cheapest on Lazada, with a guarantee of getting the authentic one. Other powerbank that I can recommend is the Romoss Sense 6P 20,000mAh, it is at P785 but comes with a free carrying pouch. I bought this cheap Gorilla Pod last 2 months ago because the original Joby’s was just too expensive for me. Now its price is even cheaper, at jus P245, you can start into vlogging. Even though the quality isn’t really on par with the original Joby Gorilla Pod, the price difference makes up for it. Mine ocassionally snaps into pieces but it is easy to re-attach, up to this day the snapping parts are not yet too loose that it becomes unusable. Perfect for those just starting up on vlogging so you dont have to spend much on the very expensive Joby GorillaPods. If you are in need of a printer, then this P949 printer might be just perfect for you. For its quality, it has been well received by other buyers, check the comments section from the link above. You can even mod it in a DIY ink inject/continuous ink system (CISS) so that you won’t have problems with refills, and spend less as you wont have the need to buy new cartridge for this printer. For other printer deals, click here. If your family needs a videoke/karaoke for parties and other gatherings, you might want to just own one instead of renting out. The P1500 is so worth it with all the 9000+ songs, today is a good time to own one, since the holidays is coming. It comes with free premium mic as well. Lazada TV deals – 32″ LED TV at just P5k. I bought my Xtreme TV from same 11-11 deals last 2 years ago. It is till working fine up until now, no problems or issues whatsoever. Lazada camcorder deals – for other deals with sports camera, dash cams, sd cards, and other accesories. Lazada speakers and home theater deals – up your home entertainment with these sulit deals. That’s it for now, we will update this post if ever we manage to find new voucher codes/discount coupons or new awesome deals you can take advantage. They are free shipping and available for cash on delivery. Enjoy shopping! Using my links when buying from Lazada will earn me a small commission that will help me on maintaining this site. It is like buying me a beer, thanks!